Our brave little team has been occupying the Shell drillship in Taranaki for well over 48 hours now. Raoni, Shayne, Viv, Shai, Lucy and Mike are camped at the very top of the ship's 50m drill tower. All they have with them is what they carried up on their backs. While they stay on the ship it won't be leaving for the Arctic to drill for oil. 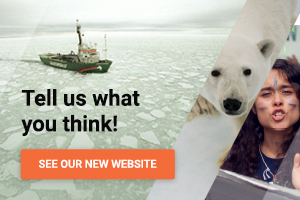 They've succeeded in bringing the world's attention to Shell's reckless plans for the Arctic. They remain determined and don't intend giving up any time soon. But it has been tough. It's cold, dirty and uncomfortable. They're hungry, and water rations are low. They've contended with loud music blasting at 3am and spotlights shone on them all night. They can't see much of what's happening in the world and hope more than anything that people are listening and taking action with them. Lucy sent us this video early this morning ... Please leave a message for the Lucy and the team below - they need some love! Nick has worked with Greenpeace for more than 10 years and is now Head of Digital at Greenpeace NZ.